McCormick has announced plans to “significantly increase the number of organic and non-GMO offerings in 2016.” And, based on the spices already on the shelves, this will be at a significant price increase. 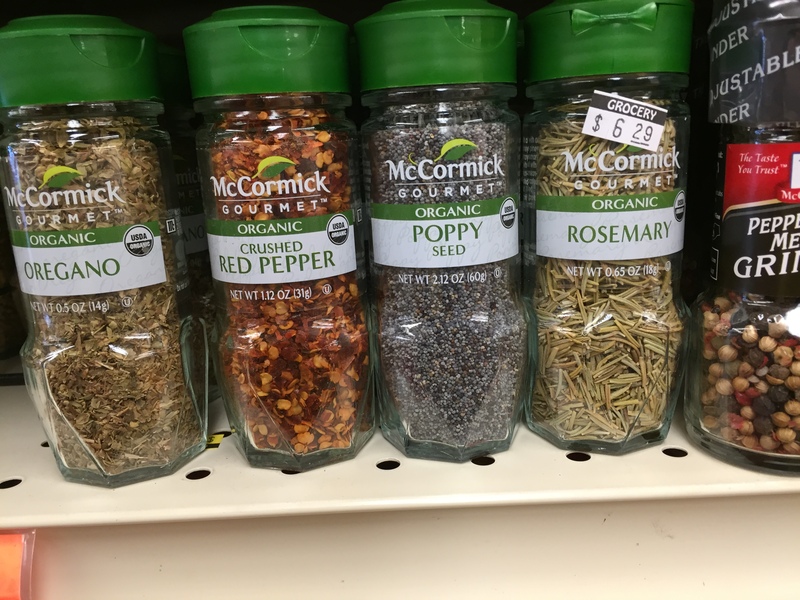 We looked at a few McCormick spices and found that organic oregano was $5.19 and regular was $3.29. And organic basil was $5.99, while conventional was $3.39 for an even bigger bottle. And what are consumers getting for all this money? Scammed! Both organic and conventional crops are sprayed regularly: just with different sprays, and the organic plants are usually sprayed more often, because the organic-approved insecticides are much less effective. And, as Bruce Ames pointed out in a classic PNAS paper, most plants make their own carcinogenic insecticides, and they are present at a level 10,000 times that of any applied insecticide. Further, since spices come from all over the world. Huy Fong Sriracha Seasoning Sticks is barely credible that the baroque organic rules can be enforced uniformly. Finally, McCormick also is making a big deal of their spices being “non-GMO,” even though there is not a shred of evidence that GM crops pose any sort of harm despite being in use for nearly 20 years. But what does this mean? There are no GMO version of any spice plant! It seems that this all comes down to vanilla. 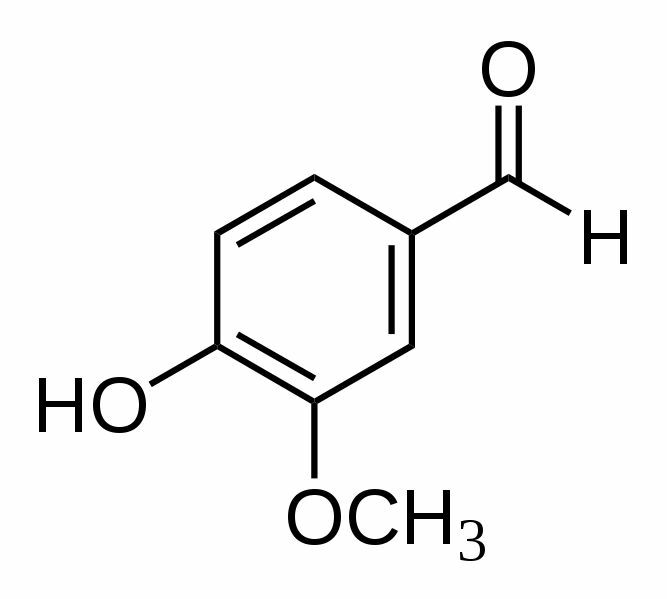 Not vanilla extracted from vanilla beans, but vanillin, the synthetic version of the principal component of vanilla flavoring. Vanillin can be synthesized in a number of ways, and one us through the use of synthetic biology, in which yeast are bred or designed to create vanillin by fermentation. The process was developed by the Swiss company Evolva, in partnership with International Flavors and Fragrances (IFF). Now, if the bacteria Evolva/IFF use are genetically modified, some paranoid consumers might think that the pure vanillin the bugs produced is somehow “genetically modified.” This is chemical nonsense, of course, vanillin is a simple 8-carbon compound and easily purified such that its precursors do not matter. While the GMO Compass organization believes that vanillin so produced would not have to be labeled because it is the same, pure compound, Food Navigator reports that it would not qualify for the “non-gmo” stamp. This seems to be more of a theological than a scientific dispute. The Motley Fool has a good summary of the business considerations in making vanillin using biotechnology. Meanwhile, McCormick, ever ready to trash science in the name of gouging consumers decided to use vanillin in the artificial vanilla products that was not produced using biotechnology. Just yesterday we learned of a hedge fund weasel, Martin Shkreli who bought up rights to the 62-year old drug Daraprim, and raised its price from $13.50 a pill to $750 a pill for no good reason except to line his pockets. This, frankly, is little different than what McCormick is doing, trading on consumer ignorance and the fictional organic halo created by lobbyists, recognizing that fear sells. Excellent summary of the situation here. Sadly, those consumers who already think “GMO” is some toxic ingredient manually injected into plants (by Monsanto, of course) will fall for their marketing ploy, hook, line and sinker. No, Monsanto sells a lot of organic seeds, too. Theological versus scientific? I know spices are important but are they really godly? There are NO non gmo spice plants? Or no hybrids? Good for McCormick! It sounds to me like the article and first comment were written by pro Monsanto trolls. People who understand the actual science of biotechnology are not “Monsanto trolls,” but scientists. That is the case here. Sadly this article lacks education on all of the studies world wide on gmo , organics and other such topics. It is a highly opinionated article narrow in understanding. Please cite the studies you refer to, because there are many thousands of studies showing that biotehnology poses no harm. This author is frothing at the mouth. Creating something by fermentation, I.e. vanillin, and creating something by injecting it with viruses, I.e. GMO, are totally different. The whole reasoning behind allowing GMO foods was the concept of “feeding the world”. If it was such a good idea, then why are so many people still starving. Also, why are so many farmers committing suicide as a result of their farms failing because they bought into the whole GMO idea? No, if the product is a single chemical compound, it is identical no matter how it is produced. One reason people are starving is because of Greenpeace’s ilitant anti-GMO stance: ripping up test plots of Golden Rice, for example. And no, GMO’s hace nothing to so with farmer suicides. In fact suicide declined with Bt cotton was introduced, because it was so much more profitable. exactly right Karen. the thinking that the answer to world hunger is more food is marketing ploy. the U.S.A. alone throws away millions of pounds of food every year simply because it don`t LOOK good and won`t sell. we don`t need more food, we need less greed. The price difference comes, at least partially, from the availabitity of organic anything in this country. While it has been widely touted that GMOs do not present any health hazards, I’m of a mind that says better safe than sorry. Think about DDT, cigarettes, agent orange, asbestos, or thalidomide; all were sold as safe until they were not. I’m not sure that there isn’t some “fat” in the price increases but if you’re not growing your own what is your option? Absolutely not. If you can prove I have received funds form Big Ag, I will donate them to the charity of your choice. Sadly this article is incredibly biased! I don’t believe for a minute that McCormick is “going organic” & totally believe that it’s nothing more than scamming uneducated consumers……however what disturbed me most is the statement about GMO’s “not being harmful”….REALLY….give your head a shake!! Renounced scientist & environmental guru Dr. David Suzuki warned decades ago about the perils of tinkering with plant genetics, and ominously stated that once you “open that Pandoras’ Box there is no going back”…..the world should have listened, but there’s no $$$$ in that, and now we all suffer because if their greed! The National Academy of Sciences and the Royal Society have both indicated that GMOs pose no harm. For me to believe anyone suggesting that introducing a virus attached to a pesticide into an organism is perfectly safe is quite foolish. Knowing these “brilliant ” biologists used the one thing an organism cannot reject ( virus ) tells me everything i need to know. I quite frankly think its irresponsible. For me to believe anyone suggesting that introducing a virus attached to a pesticide into an organism is perfectly safe is quite foolish. Knowing these “brilliant ” biologists used the one thing an organism cannot reject ( virus ) tells me everything i need to know. I quite frankly think its irresponsible and appalling. Vanillin does not contain any cis or trans double bonds. The jury “may” still be out on GMO’s but the evidence against glyphosate (Round up) is not. I avoid GMO’s partly because of glyposate and always will. Also do not forget that anything labeled USDA organic can not contain any ingredients that contain GMO’s, so by default it’s easy for a product that has the organic label to also be labeled GMO free. Regardless of the origin of spices they will have to test negative for certain pesticides. The organic pesticides the article talks about are things like Neem Oil and I’d much prefer to use this natural extract than Round up on my plants. Organic Neem is even in personal care products. This article is just trying to create a controversy around the public’s desire for safe, clean, whole foods. I hope most people are smarter than to buy in to it. So many definitions here. A pesticide is anything that kills an unwanted organism. A flyswatter is a pesticide. Not that I would propose one ought to lick a flyswatter. People using the acronym GMO as if it is a word or the name of a substance. I have used insecticides, meaning all those synthetic poisons, every day of my life for over 30 years. I go for a full physical every year, including blood work. Other than arthritis which is perfectly common for a man my age my physician tells me every year that I am far healthier that most and we joke that it must be all the bug spray. There is never a trace of anything I work with in my blood. I have no health issues that can be, even remotely, tied to pesticides. What I personally got from your article was that the spice giant was making a bundle by slapping the “power words” of non-GMO and organic on their products and selling essentially the same products as their standard offerings in fancier containers for higher prices. Basically selling both Cadillacs and Chevies, the same vehicles with different labels. Thanks for writing it, for what little good it will do. Pearls before dodos.